Short Rotation Coppice (SRC) is a plantation cultivation of fast-growing trees on agricultural land. In Germany this is currently done mainly with poplar and willow. Short rotation plantations are not considered legally as forests, as long as they are harvested at least once within twenty years after planting. Therefore they are legally treated as agricultural land and not as a subject to complex rules of forestry legislation. SRC are enjoying growing popularity in Germany, they represent an economically and environment friendly alternative to intensive agriculture. Why to use the Short Rotation Coppice? By itself fossil fuels are scarcer and while energy prices rise rapidly, renewable resources are becoming increasingly important for energy production. Target of a short rotation coppice is wood as a renewable raw material obtainable within a short time, usually between three and ten years. The harvested wood of a SRC is mainly processed into wood pellets and wood chips. Only fast-growing trees are interesting for SRC. The fastest-growing native trees are poplars and willows, which are often cultivated in Germany and Central Europe. 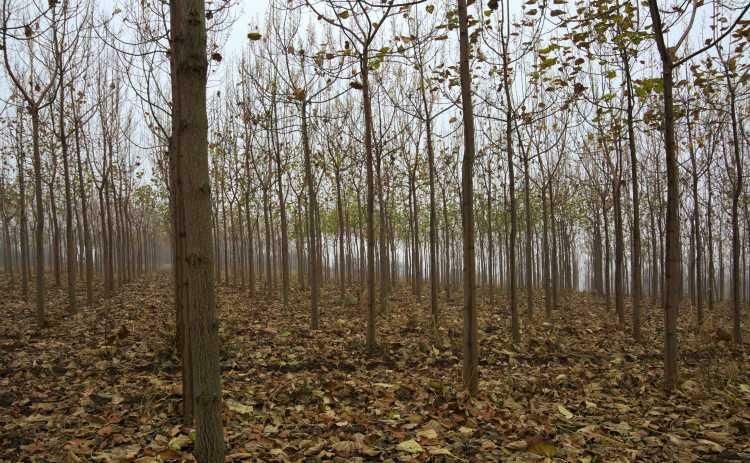 SRC Paulownia grows even faster than poplar and willow, it‘s annual increment in mass is unmatched. Paulownia shoots from the ground anew after harvesting, so it does not need to be replanted. Compared to agricultural use, the soil of a SRC is less heavily exploited. Since no tillage is done, the soil life can develop undisturbed. Pesticides are hardly used at all. SRC also offers habitat for far more species compared to agricultural use. Only in Bavaria and Baden-Württemberg's SRC facilities needs to be approved by the authorities. In all other federal states, SRC are basically without any need of authorization, but they may fall under another additional requirements, such as landscape and nature protection areas and therefore may require a permit. However, the legal definition of short rotation forestry must be taken into account. In most states, plantations of Paulownia are currently not legally defined as SRC, because they are not listed in the list of native trees and plants. When planting paulownia, it is therefore neither an afforestation nor a SRC in the legal sense, but an permanent agricultural crop. This is particularly important due to the issues of licensing, as well as subventions for agriculture. The wood of Paulownia is used for the wood chip and pellet production. For this, the trunk as well as the leaves and branches are processed. The chips and pellets are consumed in small, private households, but also in larger, industrial facilities. 4. Paulownia-energy plantations require only low expenses for maintenance, cultivation, fertilization, irrigation, etc.